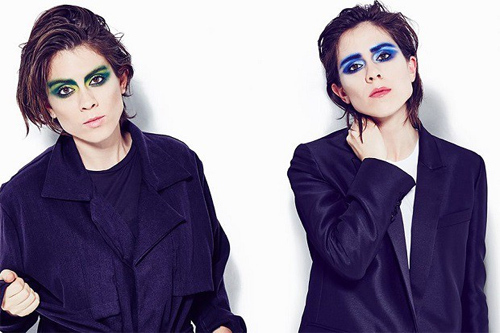 Tegan an Sara are best known in this country for the Lego Movie theme song Everything Is Awesome. Will that change with their upcoming ninth album Love You To Death? Probably not, if I'm completely honest. But for a certain brand of fan, they're synth-pop's best kept secret. Their new single, Boyfriend, takes songs like Katy Perry's I Kissed A Girl or Demi Lovato's Cool For The Summer and tells the other side of sapphic experimentation. In a recent Pitchfork interview, Sara explained that the track was written about the beginning of her current relationship. Her girlfriend had never dated a woman before, and was still involved with another guy. "You turn me on, like you would your boyfriend," she sings. "But I don't wanna be your secret any more." The video shows the sisters being forced into a series of music video clichés - confetti cannons, silhouetted dancers, green screen videos of zebras (?) - but eventually being allowed to be themselves. It's a metaphor for freedom of sexual expression, innit?